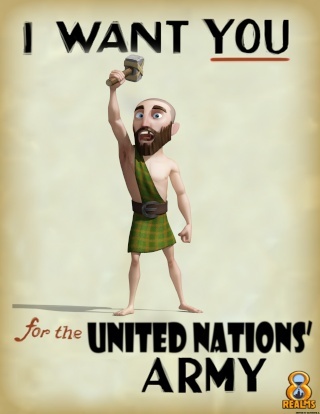 Welcome to the United Nation's Alliance forums. Please sign in to have access to our forums. New users please sign up with your in-game username. Please Invite ALL the players you know to our alliance. We are in need of an expansion. Please Register on 8Realms Maniacs at www.8realmsmaniacs.com We are now active on their website as well so sign up! Please posts your new empire names on our Wallace forum to update our memberlist. We are officially eradicating Nanites on Montgomery and Spartacus. Join in the effort of killing these blasted things! Please check our Nanite Neutralization Forum. Hello Guests, please see the Sign Up forums to sign up or visit our chat lounge for support. Please do register! PC 201 MEMBERS PLEASE GO TO FORUMS > PC201 > PRICE UPDATES FOR THE MOST RECENT PRICE UPDATES. What should we do with our Forums? Change it to another kind of forum. I am currently looking for 5 Council Members for my Runescape clan, Archaic Beasts. Your job will be to manage and organize the clan. There are two groups within the clan, The Skillers and The Fighters. The Council members, which I shall be calling My Squad, will be divided to manage one of the two groups. I don't know what Jagex has in-store for us, but it seems as though they have abandoned us. Left the game to die over time. Wallace might be our last server, I don't know. They've cause their downfall, but not ours. Everyone who is a member of this alliance is invited to my Clan on Runescape. We are called Archaic Beasts. All council members will automatically receive Admin Status. So if you haven't noticed yet, there is a new forum under the category "The Registration Area" named Referrals. Its a new way of gaining much more forum points so please do check it out! We have officially launched on Wallace and currently operaiting on it. Please post here your new Empire Names so we could update our Memberlist. We have been inactive on Spartacus, and had no order, whatsoever. So to prevent this from happening we developed a new structure for the alliance, which is more organized and disciplined. » Doomed for no reason.